African states have signed on to several international conventions that seek to end violence against women. Studies show that this acceptance of international norms has often been followed by the enactment of national legislation to address various forms of the problem. In her research, Dr. Medie seeks to understand norm implementation after states pass national laws. With Liberia and Côte d’Ivoire as case studies, she will discuss the conditions that have led to the establishment of specialized criminal justice sector agencies to address violence against women and explains how these agencies have affected the attitudes and performance of the police and gendarmerie. She will demonstrate how the United Nations and women’s organizations have influenced norm implementation and discusses how domestic political conditions limit their influence. 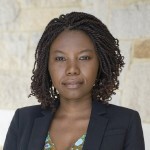 Peace A. Medie is a Research Fellow in the Legon Centre for International Affairs and Diplomacy (LECIAD) at the University of Ghana and a Postdoctoral Research Fellow at the Woodrow Wilson School of Public and International Affairs, Princeton University. Her research centers on the dynamics of violence during and after conflicts and the steps that state and non-state actors take to address this violence. Her book manuscript, Global Norms and Local Action: The Campaigns to End Violence against Women in Africa, examines how international organizations and the women’s movement have influenced the implementation of gender-based violence norms in Liberia and CÔte d’Ivoire. Her work has been published in African Affairs, International Studies Review, and Politics & Gender and has won several awards, including the 2012-2013 African Affairs African Author Prize. Peace’s research has been supported by grants from the Harry Frank Guggenheim Foundation, the Social Science Research Council, and the American Political Science Association. She delivered the Royal African Society’s 2015 Mary Kinglsey Zochonis Lecture. *Please note: Photos and/or video recordings of this event may be posted on the CIPS website, newsletter and/or social media accounts. This event is free and in English.